myDNAi is a package of classroom resources and tools that allow teachers to create their own materials. Working closely with expert Teacher Fellows, we developed 15 lesson plans that include: objectives, correlations to National Science Education Standards, student worksheets, preparation notes, and supplemental materials. The customized DNAi experience begins with registration and the creation of a myDNAi homepage. This easy to edit page includes a greeting, access to DNAi lesson plans, and Internet links. 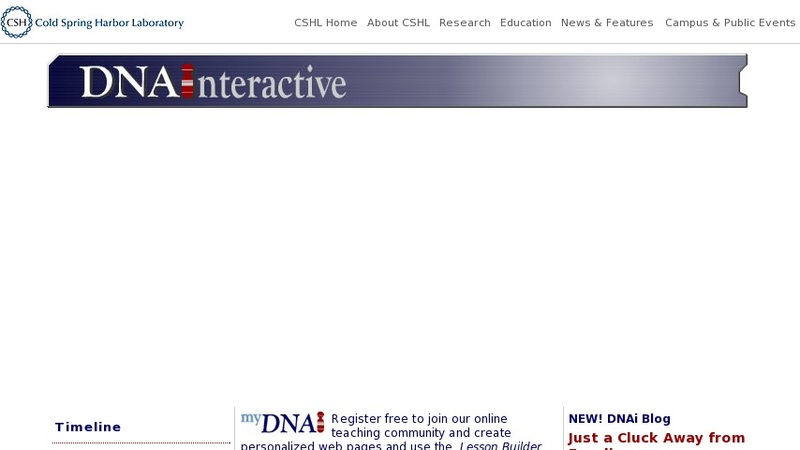 The customized homepage is stored on the DNALC server and is accessed by a unique URL. myDNAi is also the access point for Lesson Builder, our unique editor that allows teachers to build custom lessons from more than 1,200 multimedia objects (video, animations, photos, transcripts, text) used to construct the DNAi Internet site. A keyword search looks for matches among more than 30 metadata fields that describe each object. Then, using a simple "drag-and-drop" editor, the teacher selects and organizes the multimedia objects into a lesson. Each teacher lesson is then saved on the DNALC server and accessed by students using a unique URL associated with the teacher's profile. A lesson can be modified and saved in different versions for use in different classes!